Dynatek’s patented* Coating Durability Tester utilizes a Hyper Drive linear motor to produce an adjustable bellows compression which allows for physiologically relevant stent loading conditions for up to 20 test samples from physiological to accelerated testing rates of up to 150Hz. 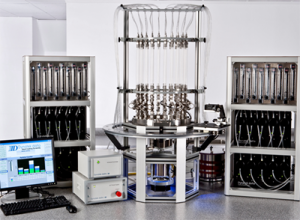 Dynatek’s laser particle detection system allows accurate real-time counting, sizing, and data logging of shed particles from each drug-eluting stent during testing, giving a time course of shed particulates from each sample. The large number of samples greatly benefits manufacturing QA when ongoing testing of approved stents is required. FDA accepted with appropriate documentation. Compact integrated mounting stand or benchtop configurations available. Ability to test samples of varying sizes of the same design at the same precisely controlled test parameters. Patented* system used to detect and identify, in real time, the number and size of shed particles from each sample. Integrated system has a smaller footprint than previous systems. Advanced universal controller with unmatched data collection ability. Data logging to a TDMS file which can be accessed by Excel or other software such as DIAdem and Matlab, for managing, analyzing, and reporting the test data collected. Unique redundant filtration system that allows for filter changes without test interruption. Frequency, temperature, and pressure controls give the user the ability to establish, maintain, and recall required test parameters. Ability to monitor sample tube pressures at all test frequencies. Closed loop laser micrometer feedback allows for automatic control and monitoring of long-term test parameters. Long life electromagnetic Hyper Drive linear motor. Design allows for easy access to test samples. Universal controller allows for future expansion of the CDT20 system to accommodate future host computer technology. Future upgrades with advance SCADA technology allow complete lab monitoring of all machines from a single host computer. **Number of test samples dependent on diameter and compliance of sample tubes.